If you take a look over at our YouTube Channel, you will see we have been busy bee’s recording short informational videos to explain the key features of each Recliner in our Lafuma range. We realised that it can be difficult to decide which recliner is most suitable for you when making an investment in a high quality recliner. It’s not a decision you want to rush; and to save you trawling through our site, reading each and every description, we thought you’d appreciate a plain speaking video that compares each chair across the range. I thought, however, that not everyone likes to watch informational videos and may perhaps prefer to read through each chair in one go; if that describes you – read on! 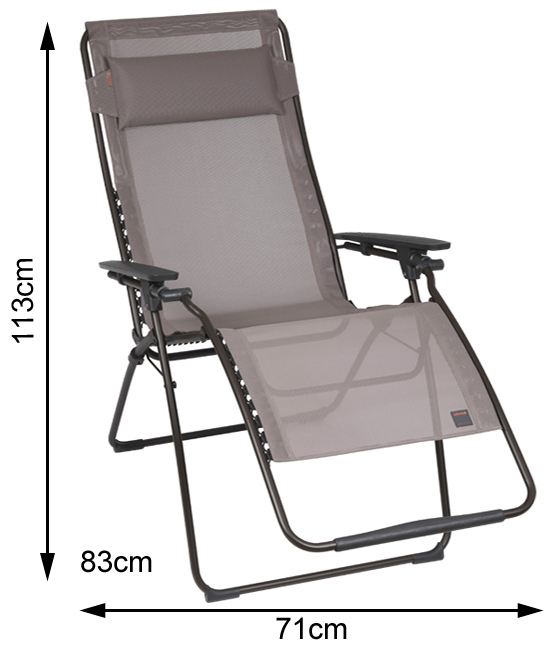 So, if you’re looking for a fantastic Reclining Chair for your garden or the beach etc., Lafuma is the perfect place to look. When purchasing from Lafuma, you are purchasing the original recliner; the French company were the first to patent their design, and they have continued to develop their skills and expertise for over 50 years to bring you great looking and extremely comfortable recliners. The perfect blend of machine engineering and human eye for detail ensures every Lafuma meets the incredibly high standards that you would expect. An open weave so as not to retain water. 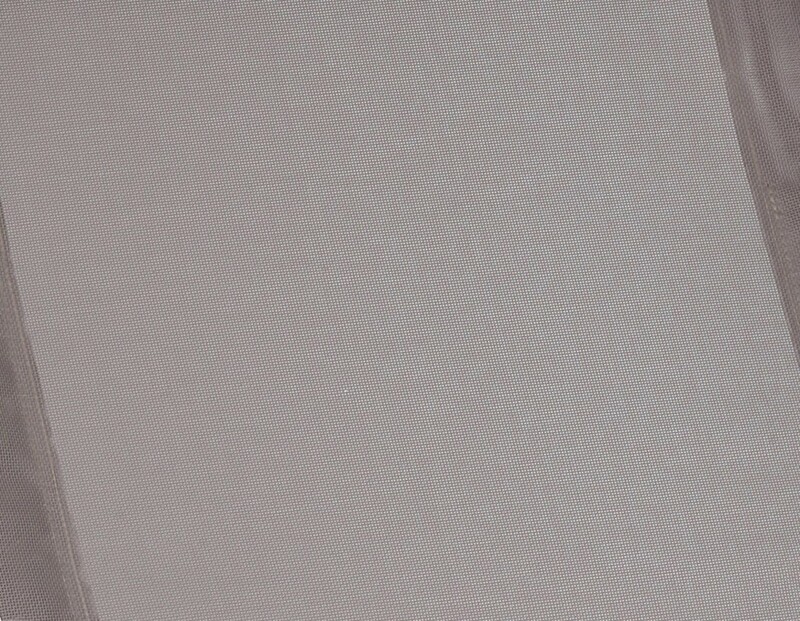 The canvas is super durable to withstand general wear and tear and accidents alike; it’s resistant to distortion and extremely easy to maintain, who wants a recliner that stains? It’s simple to wipe over, and easy to remove in case it needs a soak. Can you believe Batyline® is also environmentally friendly? It has an Oeko-Tex® label, which means it has been tested and certified as a ‘Sustainable Textile’ which is completely free of toxic substances. The patented clip system was introduced by Lafuma in 2008. 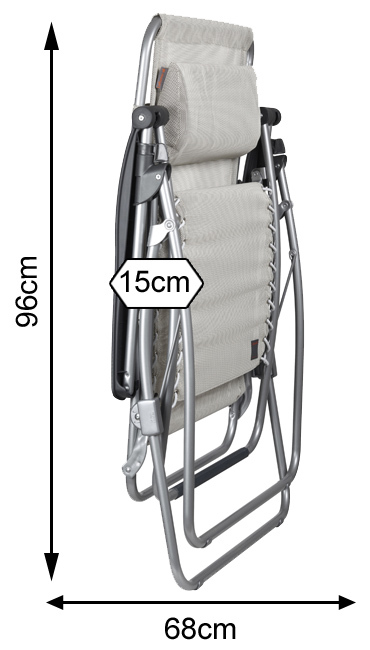 The Batyline®, or mattress seat clips directly into the frame of the chair which makes the seat noticeably firmer and significantly reduces seat sagging. Initially introduced for the Futura XL, the clip system proved so popular that it is now available in the standard sized Futura, as well as the R Clip and RS Clip. Over one hundred times more durable than laces. Makes the seat easily removable for cleaning. The clips have a three year guarantee. Every Lafuma Recliner features multiple possible positions it can be reclined to, if you don’t like being reclined back all the way, you can bring yourself up to your perfect position and stabilise it there. The stabilisers, which are underneath the arm rests on either side of the chair, can be pushed in or pulled out to maintain your preferred relaxed position. But please note that the stabilisers do not completely lock you into position, they simply help to keep your position steady. Fold up neatly, so they’re nice and slim for storage and transportation. Are lightweight so they’re easy to carry around (obviously some are lighter than others- weights are below). 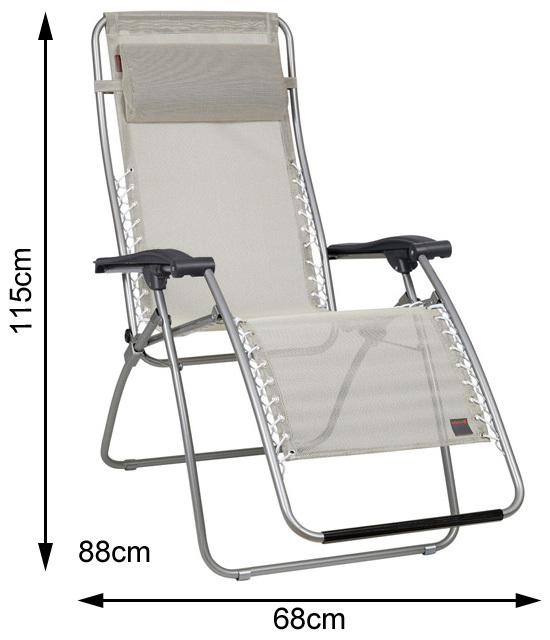 Recline with a gliding motion so there’s no need to strain any part of your body. Open and close extremely easily. There are five main chairs in the Lafuma Range at Philip Morris and Son; the R Clip, RS Clip, RSXA, Futura and Futura Air Comfort. The standard Futura also comes in XL. 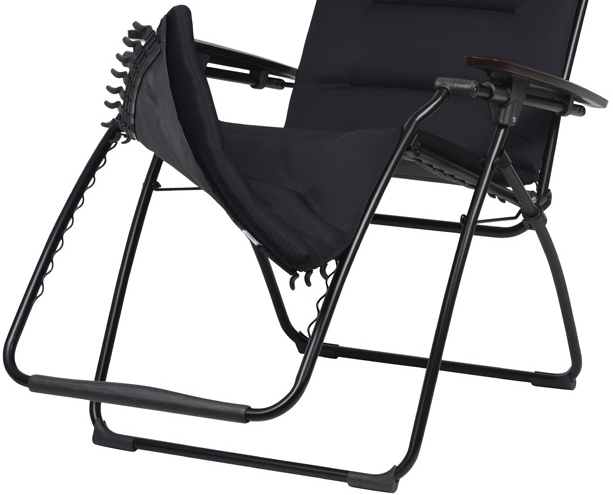 The R Clip Recliner is the entry level chair that Lafuma offer. Clip system fastening up to the arm rest. 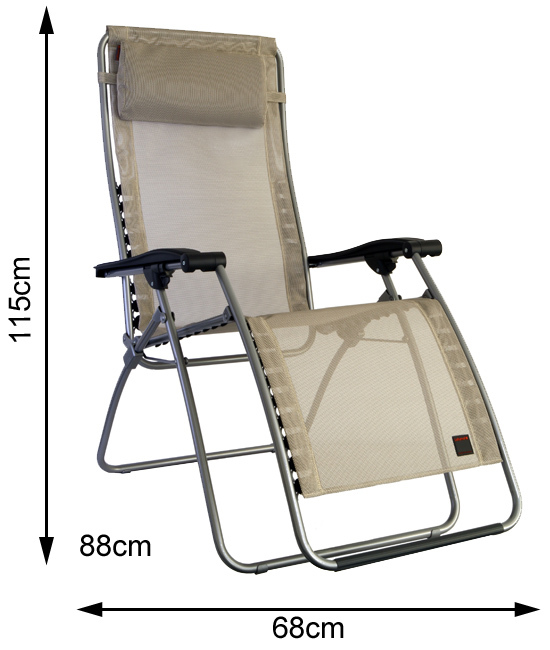 Position adjustment, with stabilisers to help maintain your most comfortable reclining position. 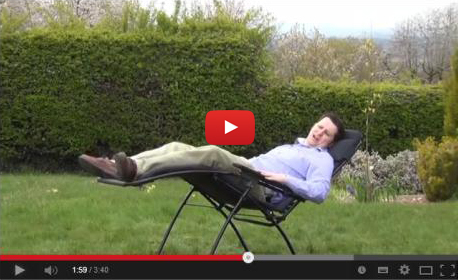 Recline using your bodyweight, pushing with your back. Adjustable and removable cushioned head rest. Small foot pads on the base of the frame for non-slip positioning. Two year guarantee on the frame and material. Three year guarantee on the clip system. 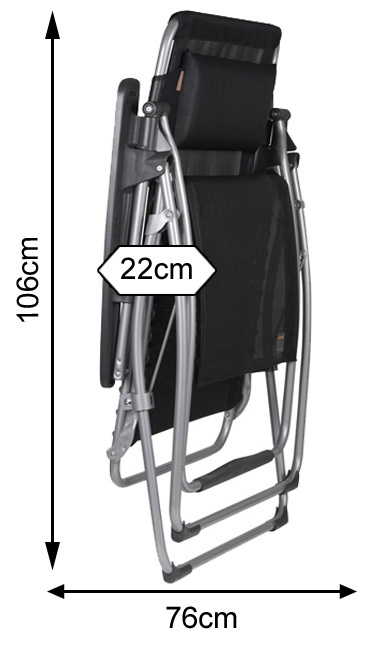 Holds up to 140kg in weight. The RS Clip Recliner is the next step up from the R Clip. Slightly more tapered back frame to shape to your body. Foam inserts on the armrests for extra comfort. Five extra clips (compared to the R Clip) along the back of the recliner to give you firmer support. 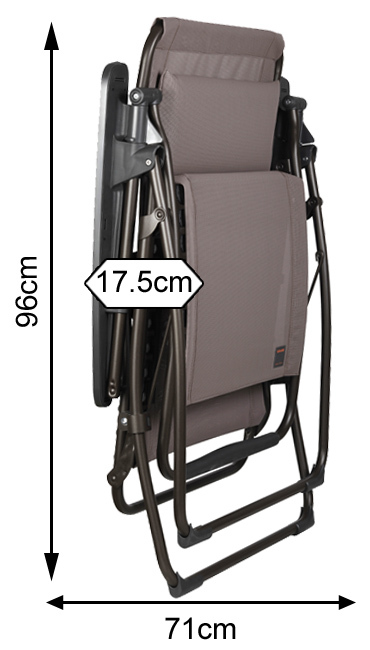 The Futura Clip Recliner has all the same great specifications but slightly more advanced. Tapered frame to shape to your body. Extra clips further up the back for firmer, more comfortable support. Ergonomic dual-plane textured resin armrests (smooth plastic, mottled finish). You can recline using only your arms by pushing on the arm rests, so there’s no need to use your legs or back. Slightly different designed adjustable and removable cushioned head rest, which is wider with easier adjustability. High stability, non-slip foot pads on the base of the frame. 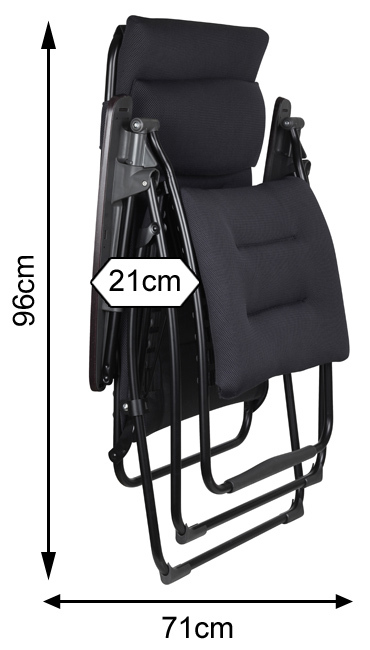 The Futura XL Recliner has all the same features as the Futura Standard (above) but scaled up. Reinforced bar under the seat to accommodate extra weight. Consider the XL if you are above 6ft. 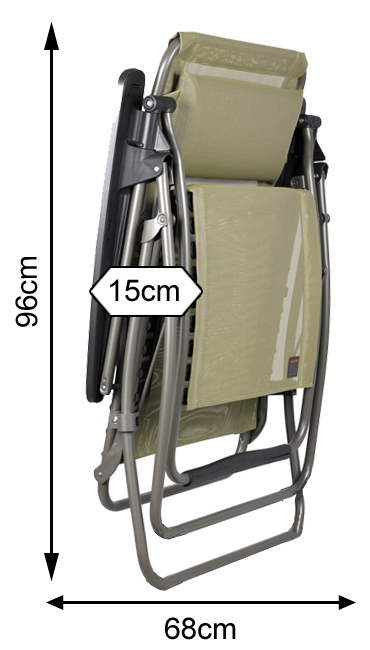 Holds up to 150kg in weight. The Futura Air Comfort is at the top of the Lafuma range. Removable triple layer mattress seat. A Batyline canvas ventilated base layer; breathable, permeable cotton polyester foam middle and a 3D ultra-breathable honeycomb mesh top layer. Mattress does not retain water, it simply goes straight through! Adjustable and removable mattress head rest. I’ve left the RSXA Recliner until last as it uses the Lafuma Lacing system, as opposed to the Clip system. The last recliner in the Lafuma range to use the lacing system – it uses elastic lacing cords to attach the canvas seat to the frame. The lace suspension gives a hammock-like effect and feel. This is for you if you’d rather have a less firm, more flexible support. Some people find the softer support more comfortable if they have back problems. Armrests have foam inserts for extra comfort. Laces are not guaranteed, but are an easily replaceable spare part. TIP: Always open your recliner all the way, fully reclined, so the legs are open as wide as they will go to ensure complete stability. If you have any further questions about Lafuma, please don’t hesitate to Contact Us or give us a call on 01432 377089. Don’t forget, you can also browse the whole Lafuma Department at Philip Morris and Son. 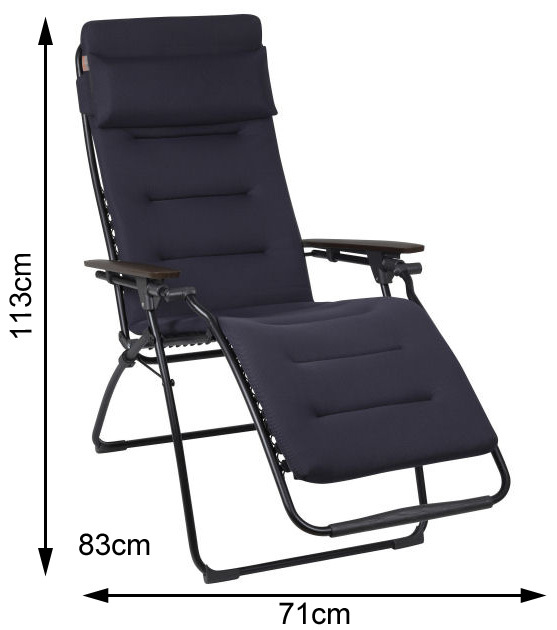 Garden Furniture, Lafuma, Lafuma Air Comfort, Lafuma Futura Recliners, Lafuma R Clip Recliners, Lafuma Recliners, Lafuma Reclining Chairs, Lafuma RS Clip Recliner. Bookmark. I have one of your standard reclining chairs and it is great. However, I heard you do one that is padded and the seat part is extra wide. Can you tell me which one please? I would like to but it as a present for someone. The Lafuma Air Comfort (http://www.philipmorrisdirect.co.uk/lafuma-futura-air-comfort/product/) has a padded seat and is fractionally wider. 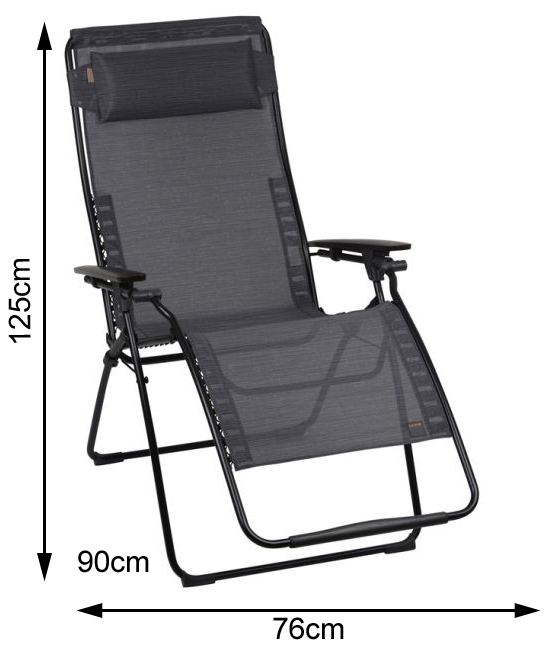 However, the Lafuma Futura XL (http://www.philipmorrisdirect.co.uk/gardening/lafuma/xlrecliners/dept/) is the scaled up version of the standard Futura, which has a wider seat as well as being longer, but unfortunately that does not have any padding. 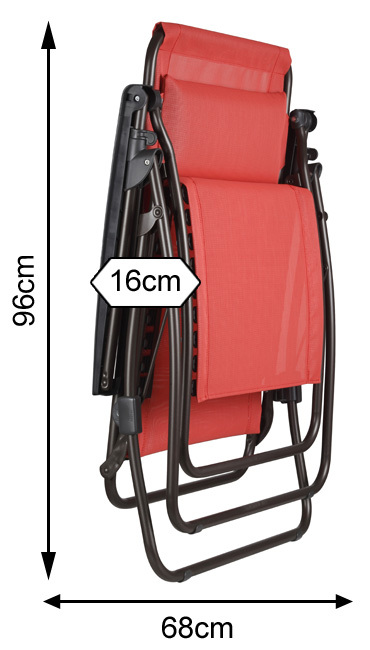 No problem, the top of the chair frame can pull apart so that you can slide the material off. Do these all tilt back to the same position? i know the RSX goes back so your feet are above your head but was interested if all of the others also went back that far? If you click on the video at the top of the blog it will take you to our YouTube site where you can choose which recliner you want to view. Each video will show you how far the recliner tilts back. I am looking for a good recliner since I had back surgery! I was wondering, how far down does this chair recline? 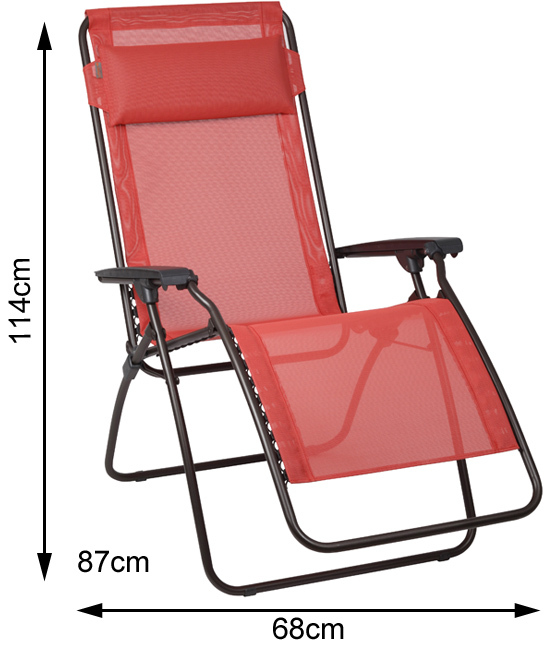 I am looking for a recliner that reclines where my head is parallel to the floor and my legs stay in the bent position. Hard to explain.. Unfortunately we do not stock a recliner that allows your head to lie parallel to the floor whilst your legs stay in a bent position. What is the best way to clean the mesh chairs? The headrest looks like it might have mildew or mold after being in the rain many times. Hi, any advice on how to wash/ clean a padded lafuma? When reclined, how high are the feet off the ground?